This painting hangs in our bedroom. 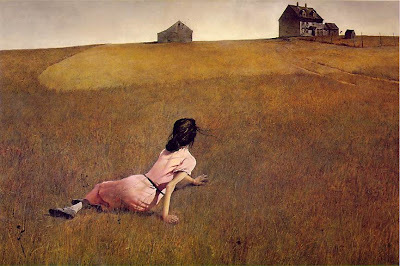 It is called "Christina's World", and was painted in 1948 by Andrew Wyeth. I first saw it while visiting the Brandywine River Museum in Chadd's Ford, Pennsylvania shortly after I began college. The Museum Shop was filled with Wyeth family art, but I was intensely drawn to this one and stood staring at it for quite some time. I must have caught the attention of the the museum shop manager because he came over to me, and quietly began to tell me the story behind it. The girl in this painting is Andrew Wyeth's neighbor, Christina Olson. She was stricken with Polio, and was paralyzed from the waist down. This painting is a depiction of her looking back at her farmhouse after crawling out into the open field to pick flowers. I have fallen in love with this painting. For it's beauty and simplicity, but for much more. As I go through life and my experiences sway and shift to align with my circumstances, this painting always seems to capture the condition of my heart. When I'm missing my family, I see in this painting my desire for the distance not to be so long and far. When I collapse on my bed mid-day out of utter exhaustion and my eye catches its spot on the wall, I'm reminded that the beauty in the flowers I'm gathering are SO worth the fatigue of my motherhood journey. And ultimately, when I'm hurt and sad, disappointed or despairing, this painting reminds me that my truest sense of home is resting in the arms of Jesus. I didn't realize how much this painting would come to mean to me when I brought it home with me all those years ago. But, as I spend hour after hour staring at "Christina's World", I see that God uses beauty mixed with heartache to create the most beautiful of landscapes. In Christina's world. And in mine. I can see why you are so drawn to it...it's beautiful! Four years of studying art and that is the most beautiful description I have ever heard of a painting. Why can't more critics be like Sarah? Patrick has such distinct and fond memories of this painting from his grandmother's house when he was a kid. When she died, that is the one thing he asked for, and it is hanging in our basement. Thanks for sharing the story behind it. 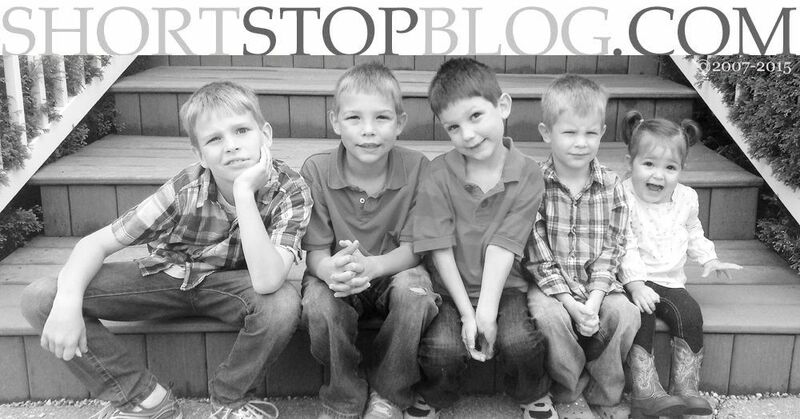 It's a beautiful painting and a beautiful story - thank you for sharing your heart. Hope you had a wonderfully relaxing Saturday night and Sunday! it's a beautiful painting and a very cool story to go with it. i can see why you'd sit and stare at it. i actually recognized it when i first opened your page. i did a report on andrew wyeth when i was in high school. i enjoy his work. beautiful painting and beautiful story - thanks for sharing. i know i got teary eyed reading your post today. the painting is so wistful and relaxing - love it! The painting is beautiful but the story you tell makes it more so. I've seen that picture so many times, but never heard the story behind it. I can see why you like it so much. Beautiful. I've never seen the painting, but now I love it since you've told the story and how you see it. Your post especially got to me, because I fall into bed exhausted often and I miss my family regularly.